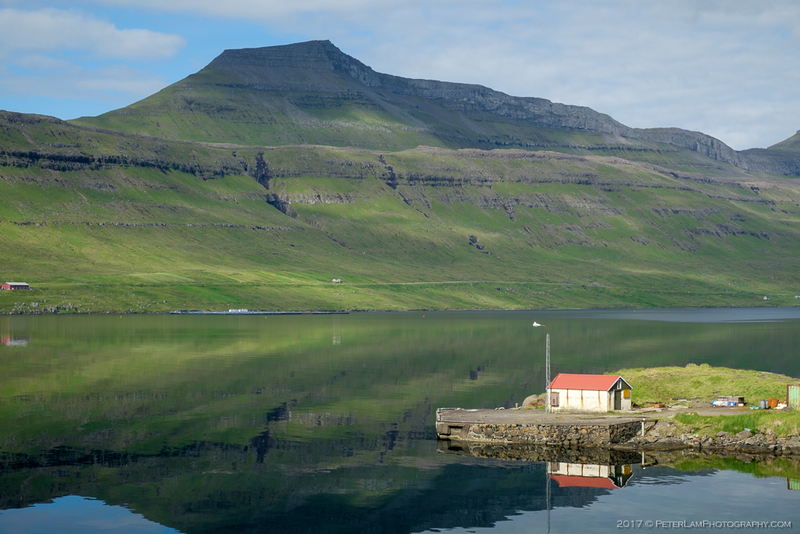 The highest point on the Faroe Islands is Slættaratindur, a 880m tall mountain on the island of Eysturoy. 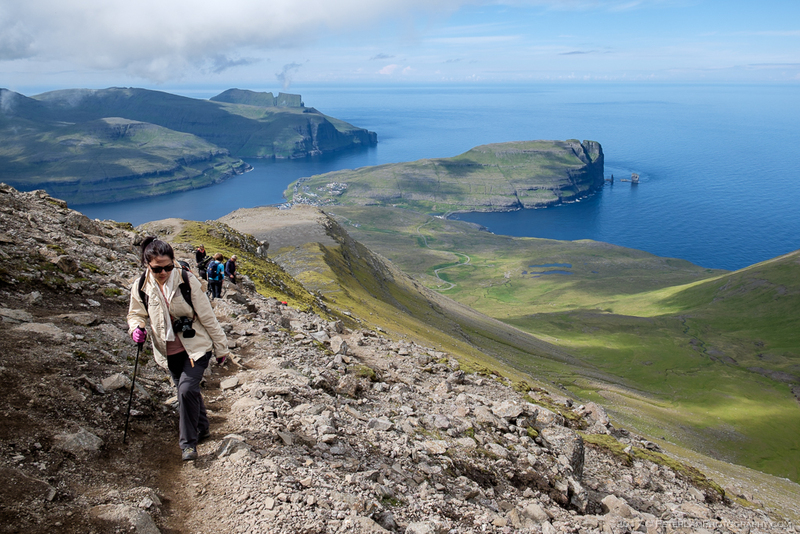 On a clear day, you can see all 18 islands of the Faroes from its peak, and some say you can also spot Iceland in the far distance! On the summer solstice (June 21, the longest day of the year) it is local tradition climb Slættaratindur to watch the sun set and then rise again a few hours later. 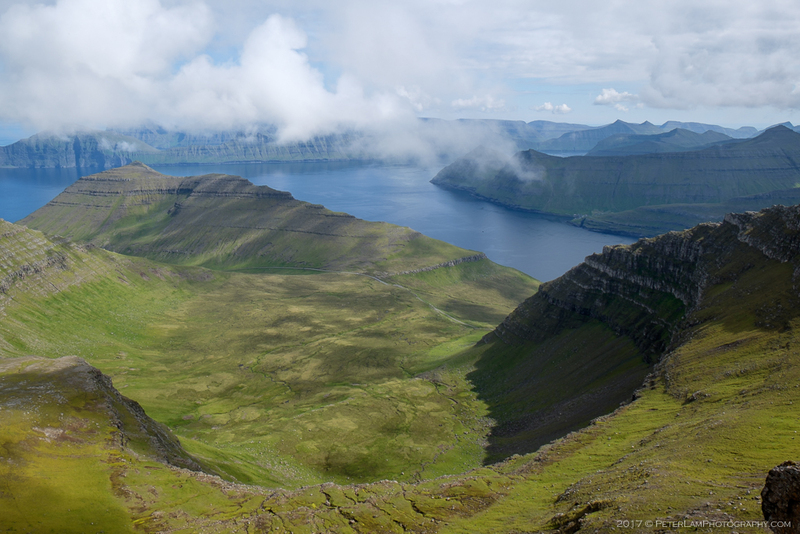 Panoramic view from the highest point on the Faroe Islands. 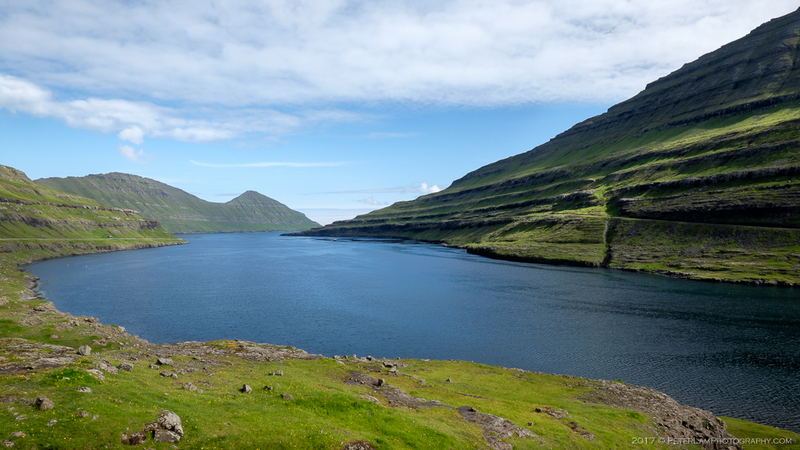 On this third day of our trip, we made our way from our home base at Klaksvík to the trailhead at Eiðisskarð, stopping numerous times on the way to take pictures of our beautiful surroundings. We found it impossible to drive any length of distance without stopping for photos – the views are truly jaw-dropping. 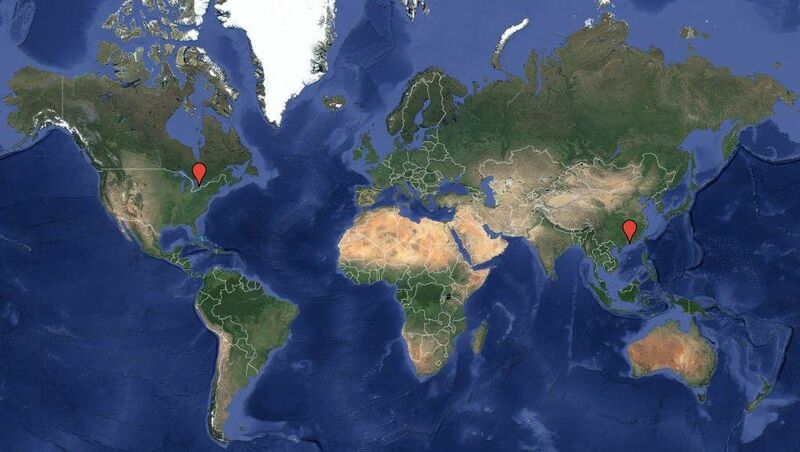 If you visit, factor that into your commute times! 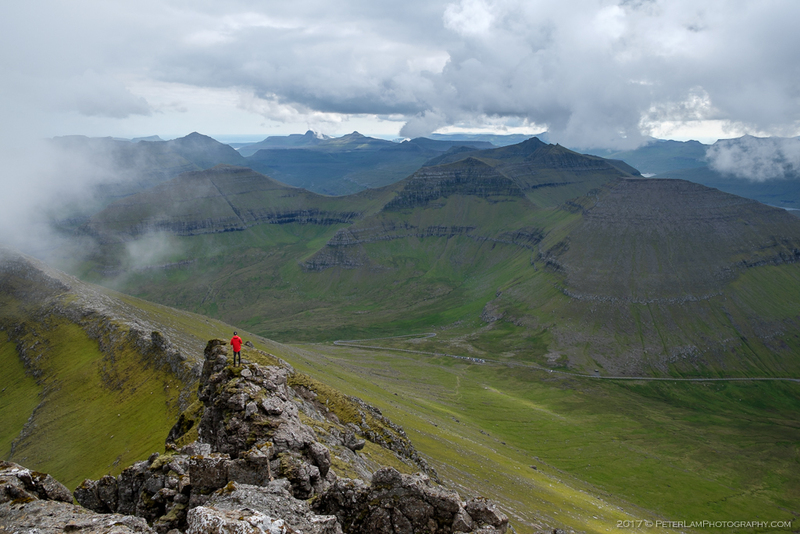 Eiðisskarð is a mountain pass between Eiði and Funningur towns, and at its highest point you will find a small parking lot and the beginning of the trail to the Slættaratindur peak. Though the trail is unmarked, it is a very popular hike, so there is little chance of you getting lost. 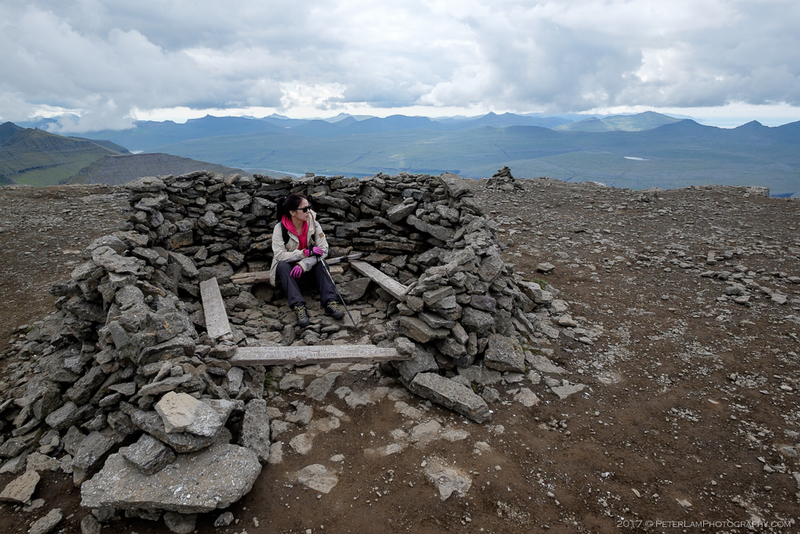 We were accompanied by many locals and visitors heading to the top, and the weather was perfect for a weekend hike. 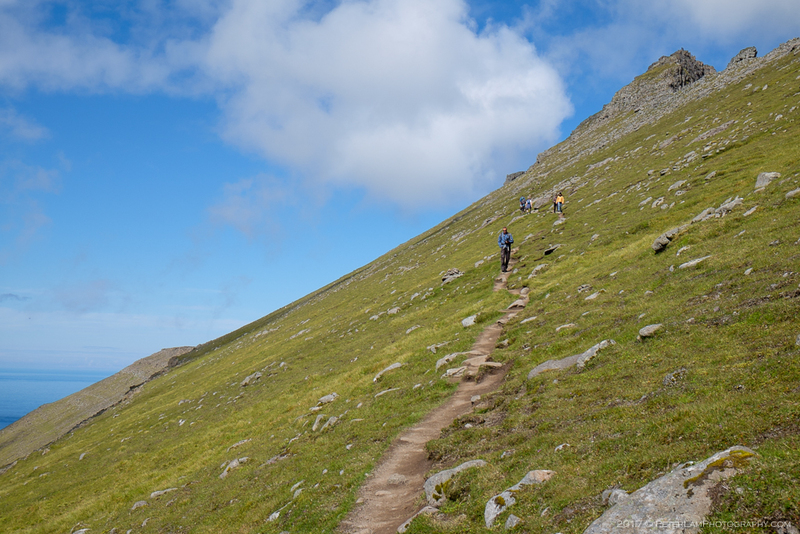 The route starts as a long grassy slope that gradually steepens into a dirt path, skirting the side of mountain. The last section is rocky and steep, but the effort is well worth it. At the top, you are rewarded with great 360-degree views of the islands. 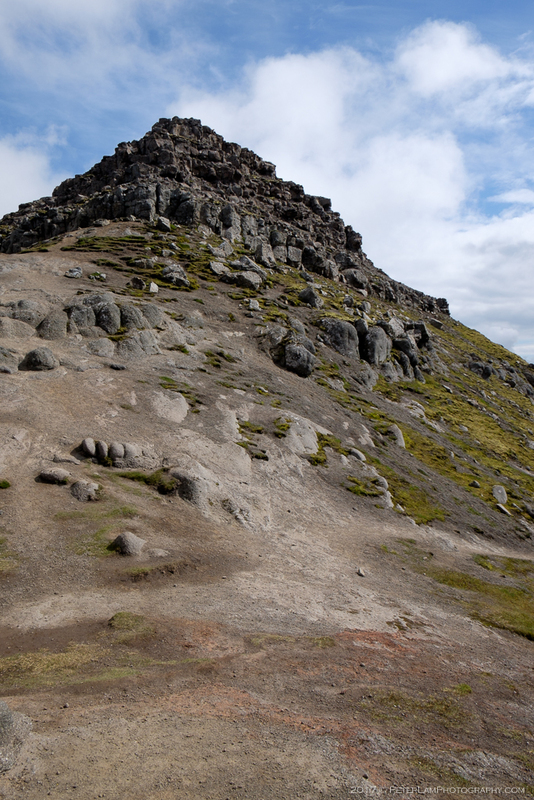 Slættaratindur literally means “flat peak”, and true to its name the summit is a wide, flat area surrounded by dramatic drop-offs. 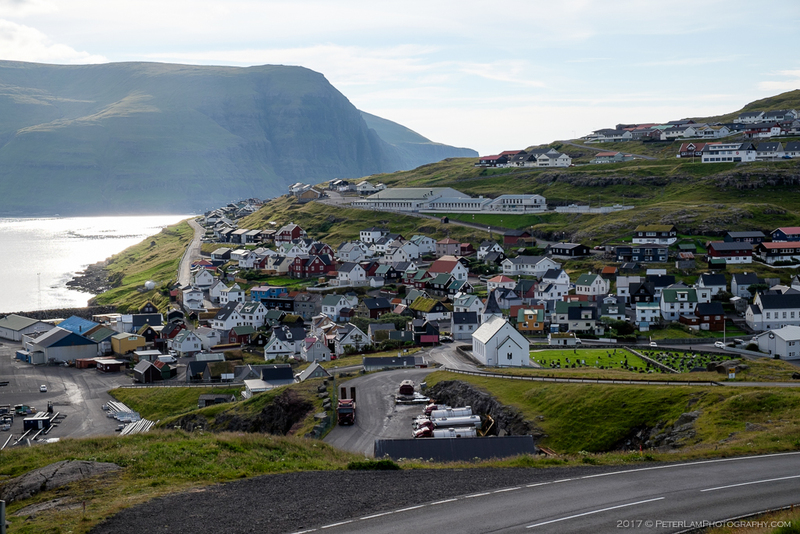 Skali village across Skálafjørður, the largest fjord in the Faroes. Skipanes village on Skálafjørður fjord. 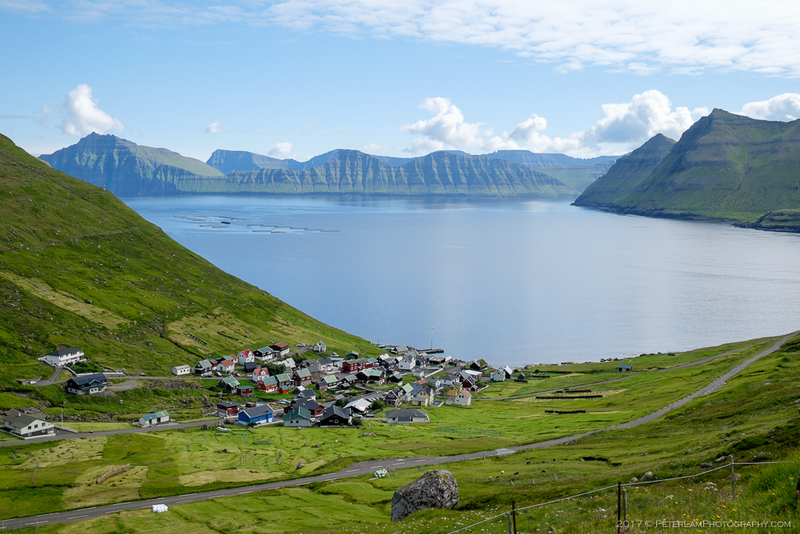 Eiði village on the north-west tip of Eysturoy island. Making enclosures for the fish farms. Eiði vilage. 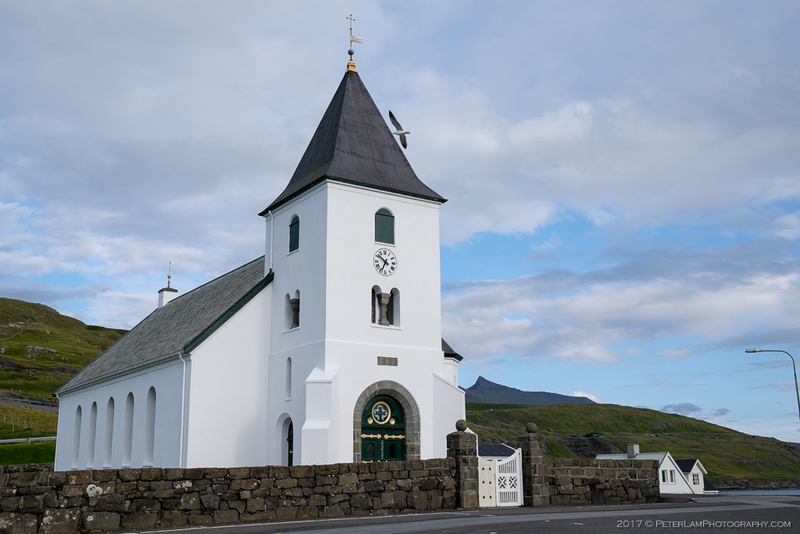 Eiði village church, dating from 1881. 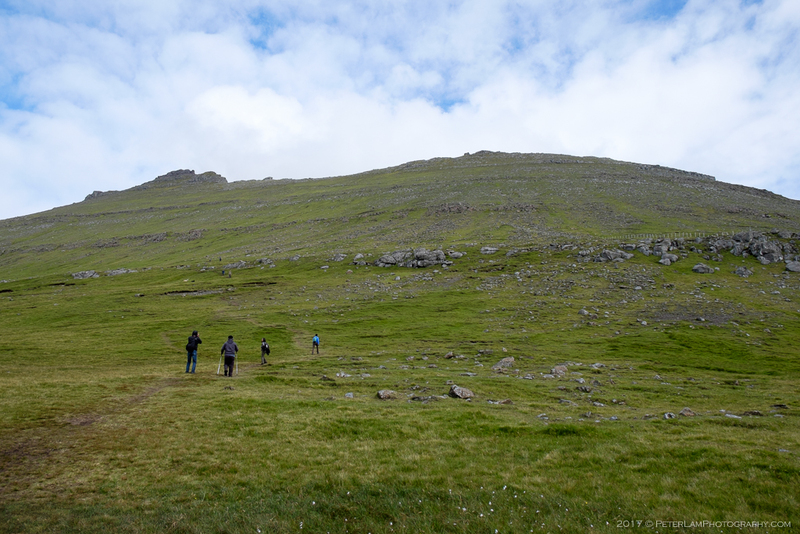 Starting the long hike up Slættaratindur from Eiðisskarð. Follow the well-beaten path and “staircase”. About half way up the mountain – the parking lot and trailhead far below. Soon the trail is a well-defined dirt path that heads into rocky terrain. Taking a break near the top. Eiðisvatn lake visible below. One last push to the top! Loose gravel and large boulders here. Looking east near the summit. Once again we got lucky with the weather. The final approach before the peak. Eiði village far in the distance. From the summit, great view south of our starting point far below. Looking northeast at the massive plains below. Kalsoy island in the distance. Yvonne in the wind shelter. True to its name, Slættaratindur is indeed a flat peak. 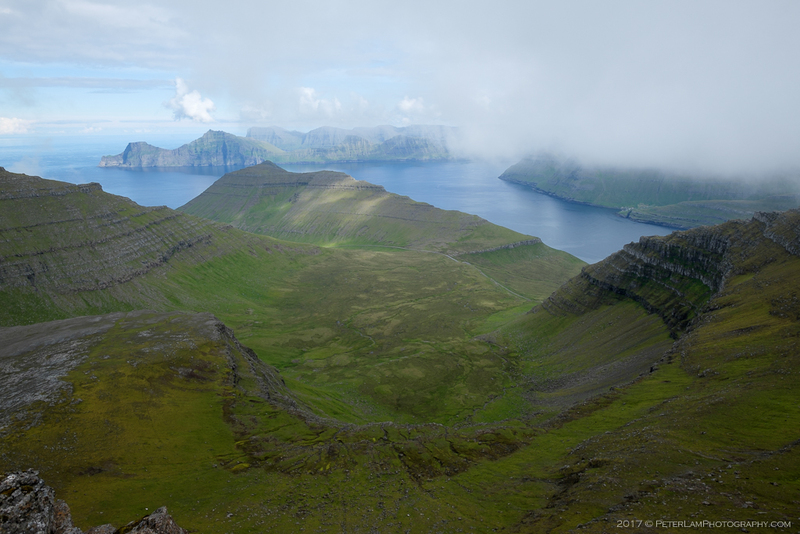 West view from the highest mountain on the Faroe Islands. Great blog! Anxious to get there! How long would you say is the hike up, and then down? Thank you! 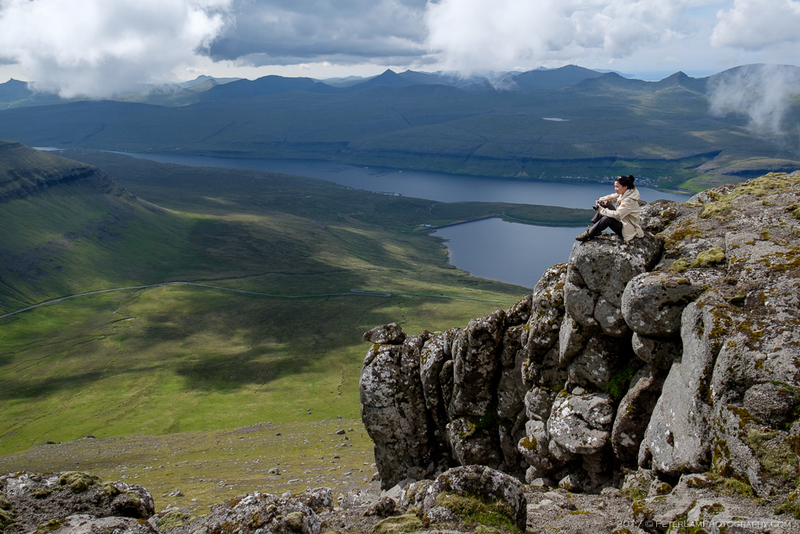 I had to look at my hiking logs… At a leisurely pace, we took about 4 hours in total, including some time at the top for a snack break and enjoying the view. 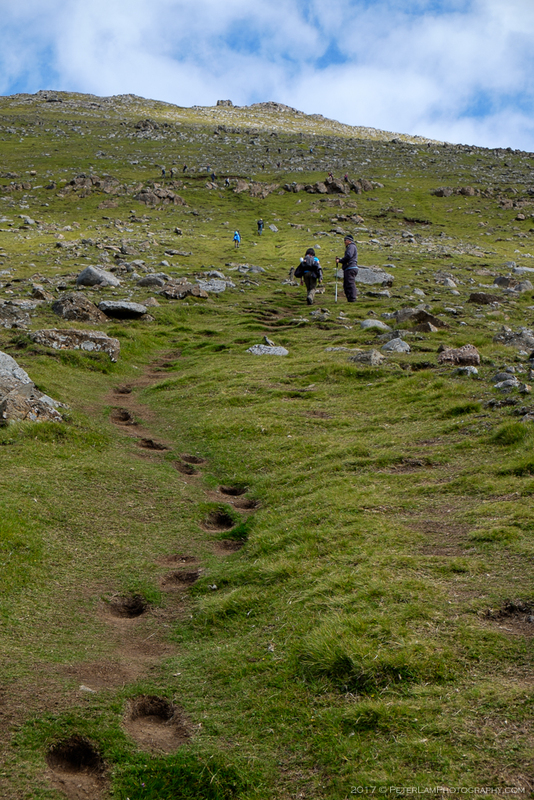 This is a popular hike with locals, too – whole families zip up and down this mountain. 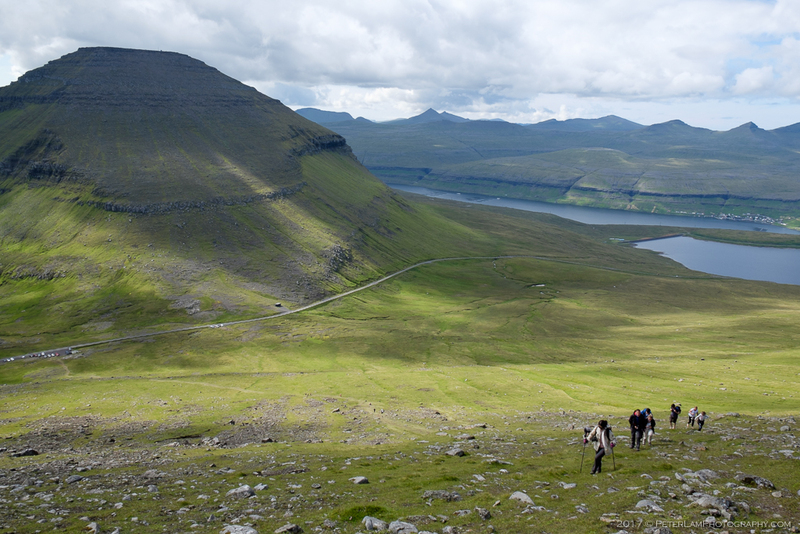 The Faroese have hiking in their blood! 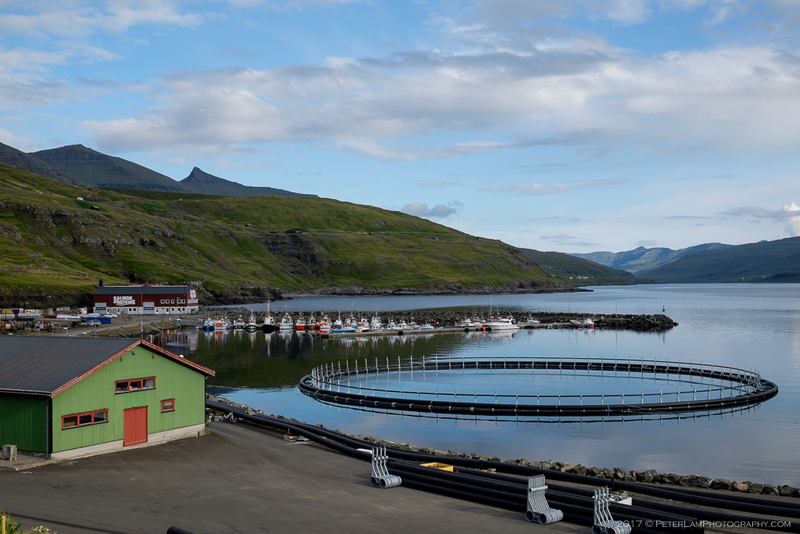 This looks great and a really Must in the Faroes! I am even considering buying those walking sticks to help in these hikes! Thanks Peter! Yes, I’ll probably go back to Patagonia next January! Tried to see your first blog on Iceland, but couldn’t, just the last one.